Ahhhhhh spring! It has sprung! I love it! 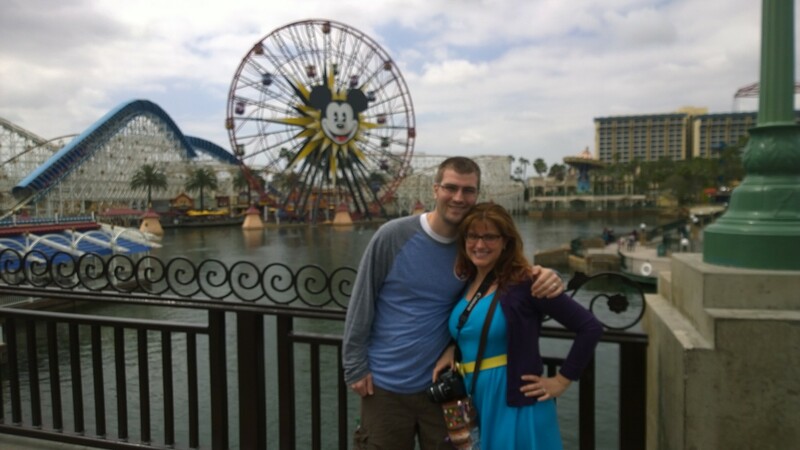 We just came back from some time in California (vacation for me, half work half vacation for Matt). It was a nice transition to spring, because I think (hope) while we were out there we missed the last of winter’s fury. 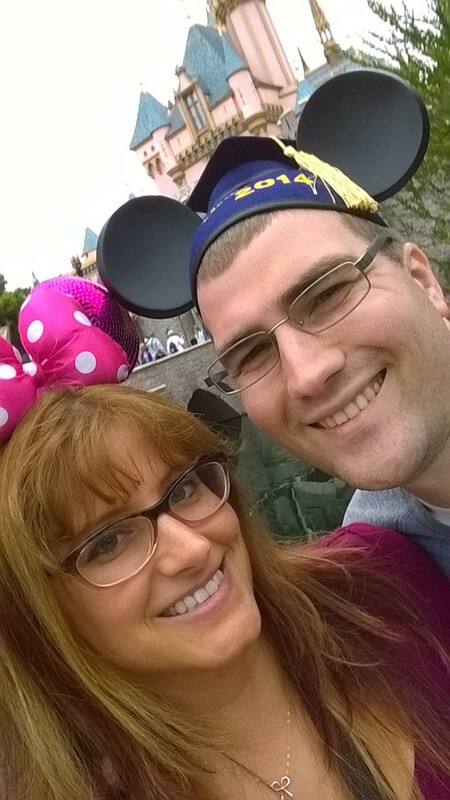 We spent the first half in Disneyland and LA. I loved it. Sleeping Beauty is my favorite classic princess, so I was very excited to see her castle. 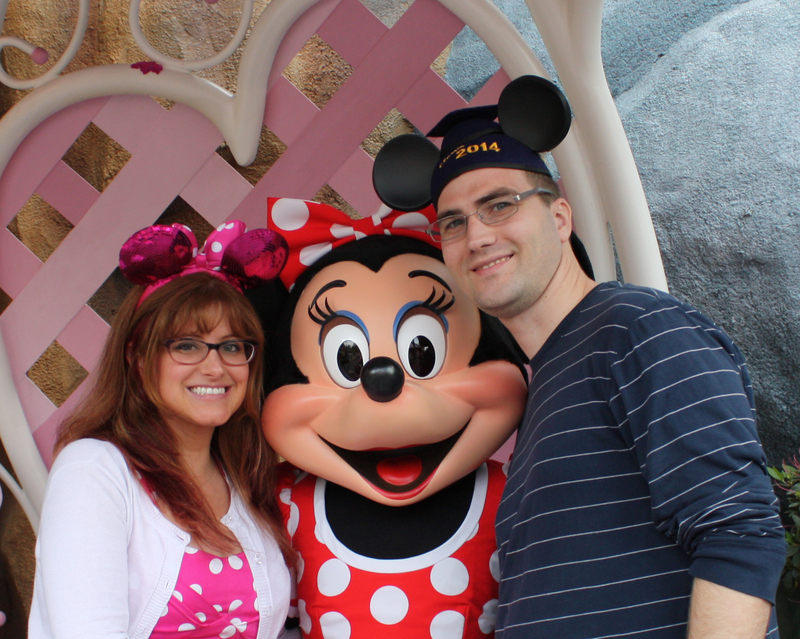 I went waaaay geeky and wore a pink polka-dot dress one day, and Matt got me matching ears. It’s like we’re twins! 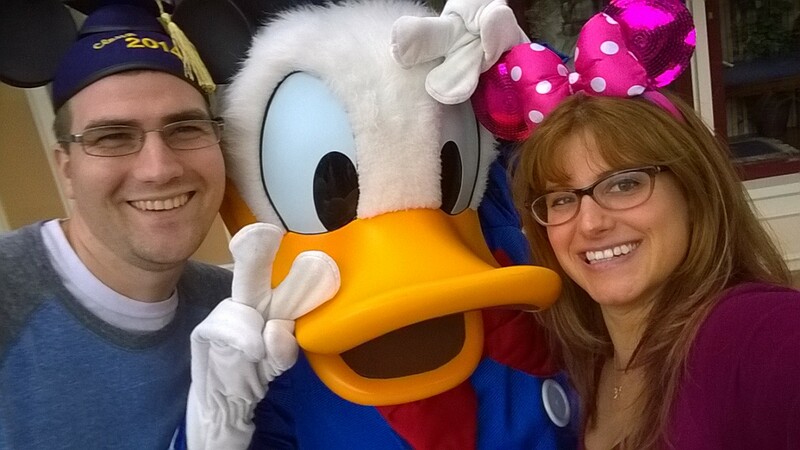 And I met my boyfriend Donald in his traditional blue Donald outfit for the first time ever. 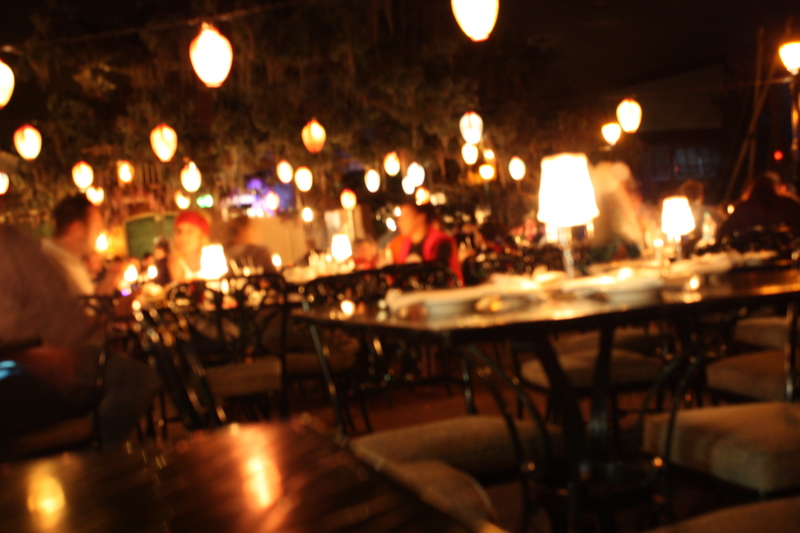 We ate at the Blue Bayou. 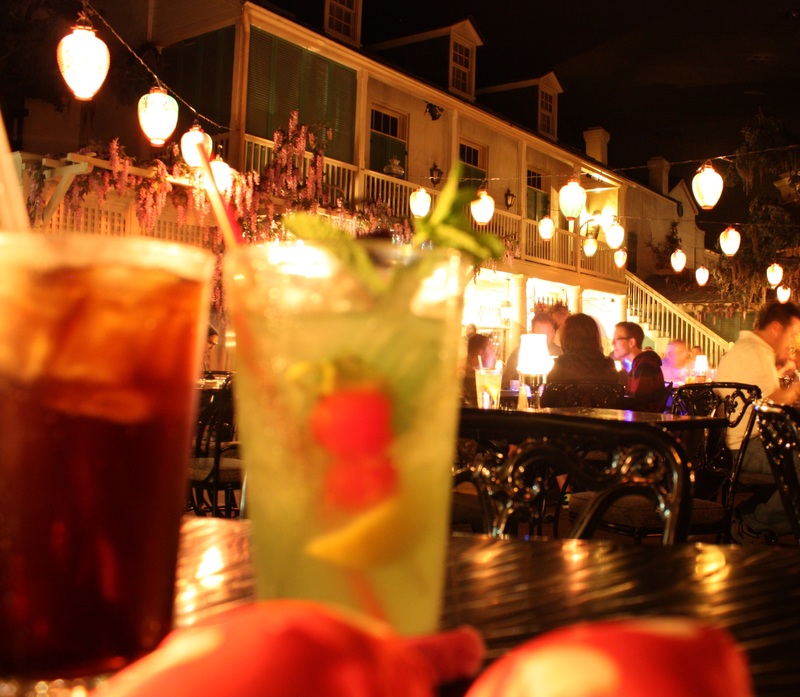 The food was delicious, and the Pirates of the Caribbean ride actually goes through the restaurant. So cool! 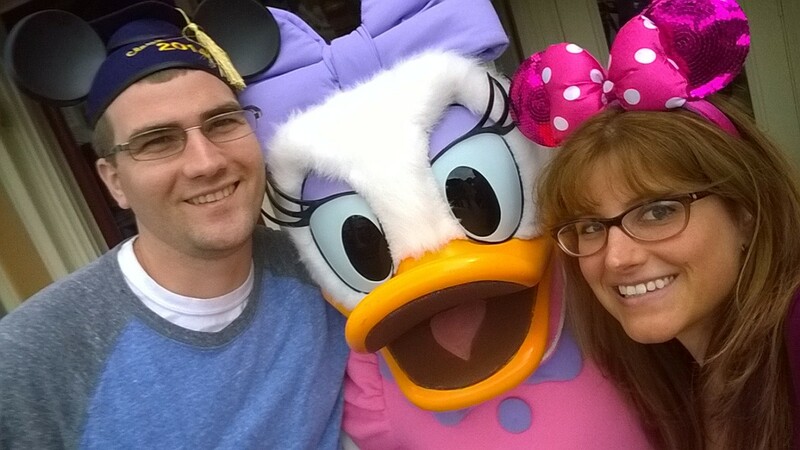 I don’t care what anyone says; you’re never too old for Disney! 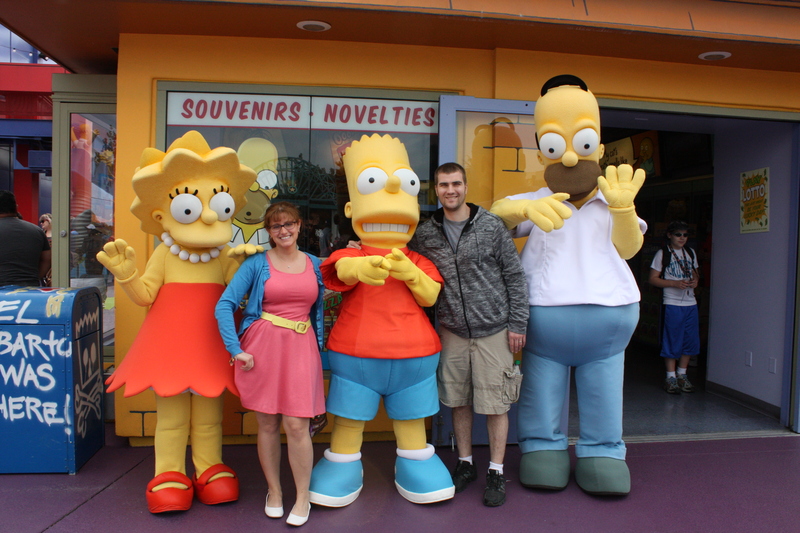 We also went to Universal studios, and it was really cool to take the studio tour and see the actual sets. 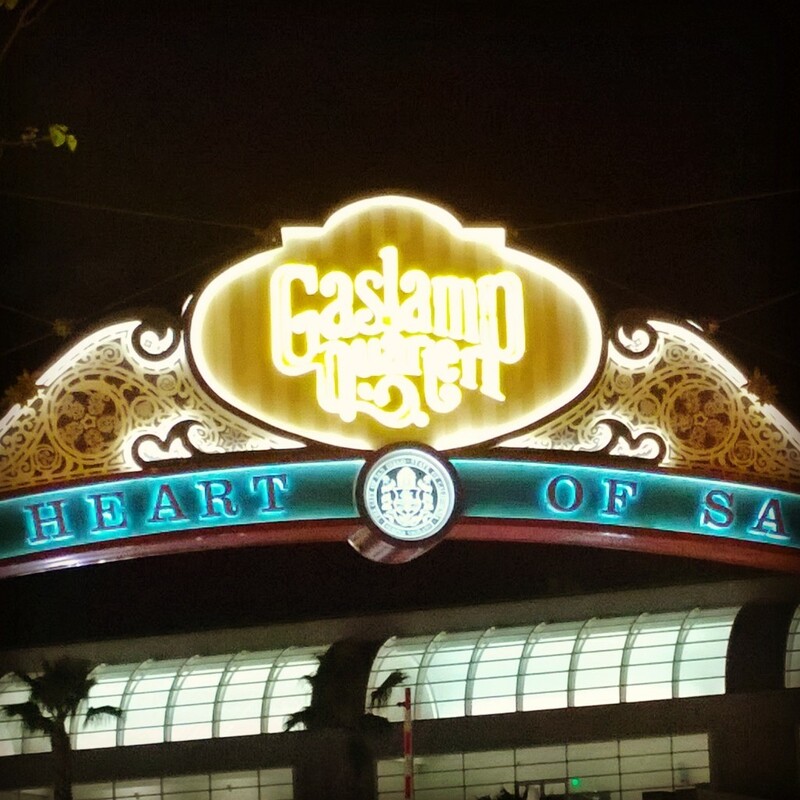 We planned on seeing more of LA, but we ran out of time because Matt had to be down in San Diego for the Drosophila conference. For the most part, he was at talks and presentations while I did some lounging, reading, and knitting (I just started learning). 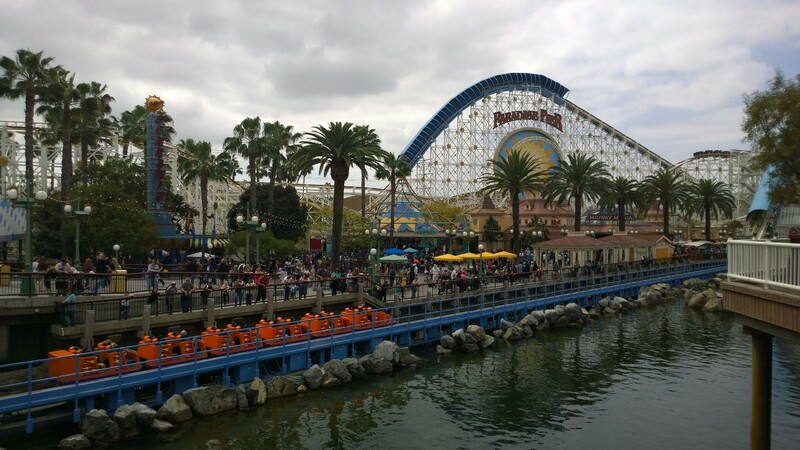 We were able to slip away for a few hours each day and see San Diego’s Old Town, Sea Port Village, the USS Midway Naval Aircraft Museum, and the Gas Lamp District. 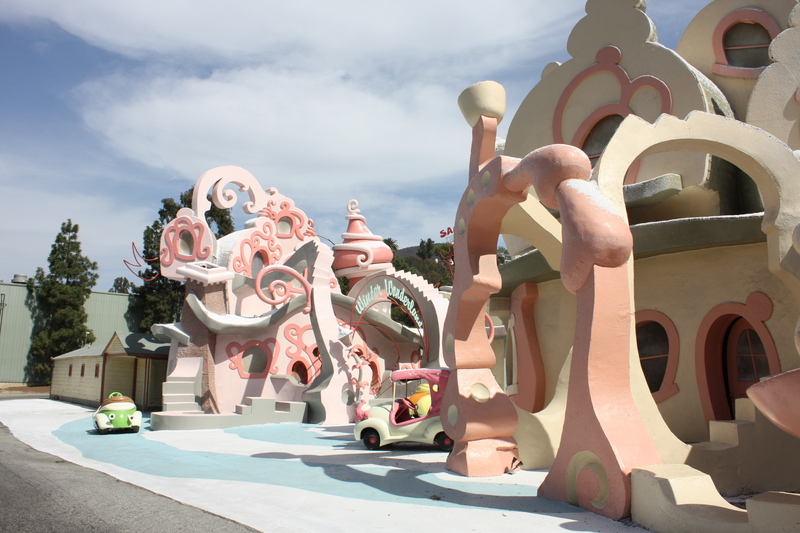 Last time we were here for the conference, we went to the San Diego Zoo. It was amazing! We didn’t have time for that this year, but hopefully next time we’re out, we’ll have some time for their Safari Park or the San Juan Capistrano Mission Gardens. I was sad to get back to reality, but I was glad to start Easter decorating! I pulled down all my Easter decorations and started to decorate. I love Easter. It’s my favorite Holiday. 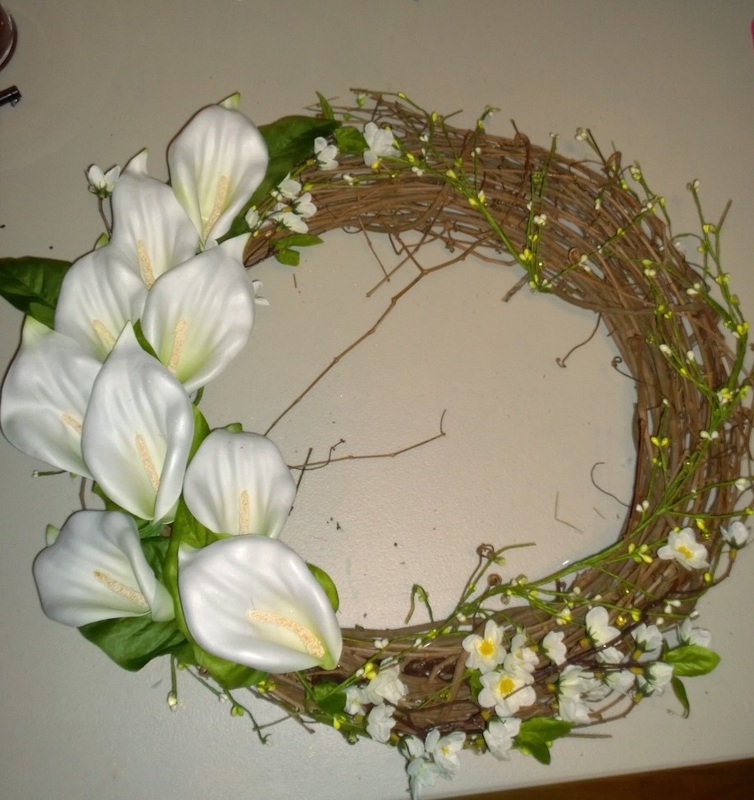 I actually have several Easter wreaths, but keeping with my wreath resolution I decided to make one. I saw a few on Pinterest that inspired this one. This was really easy. 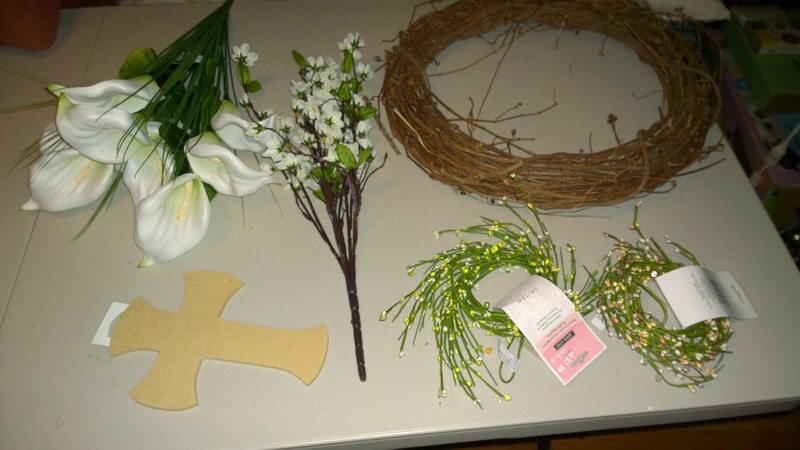 I used the green garland around the twig wreath. 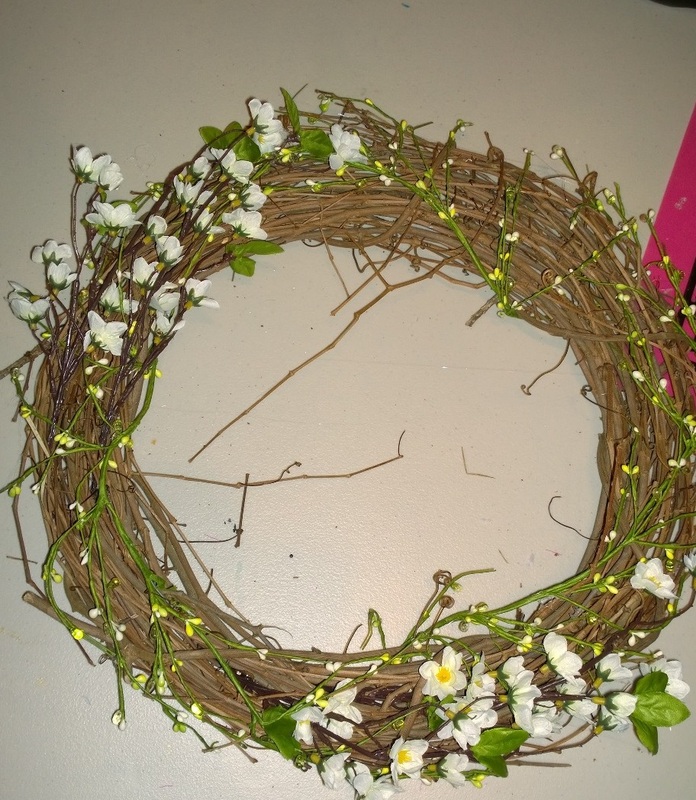 Then I added the small white flowers to the top and bottom of the wreath. 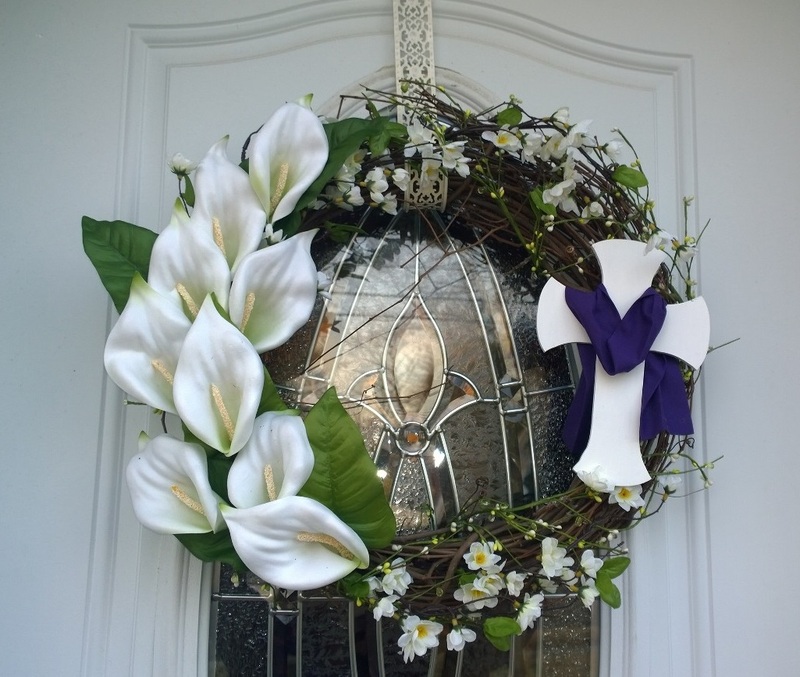 I wanted the wreath to have lilies because those are the flowers I associate with Easter. 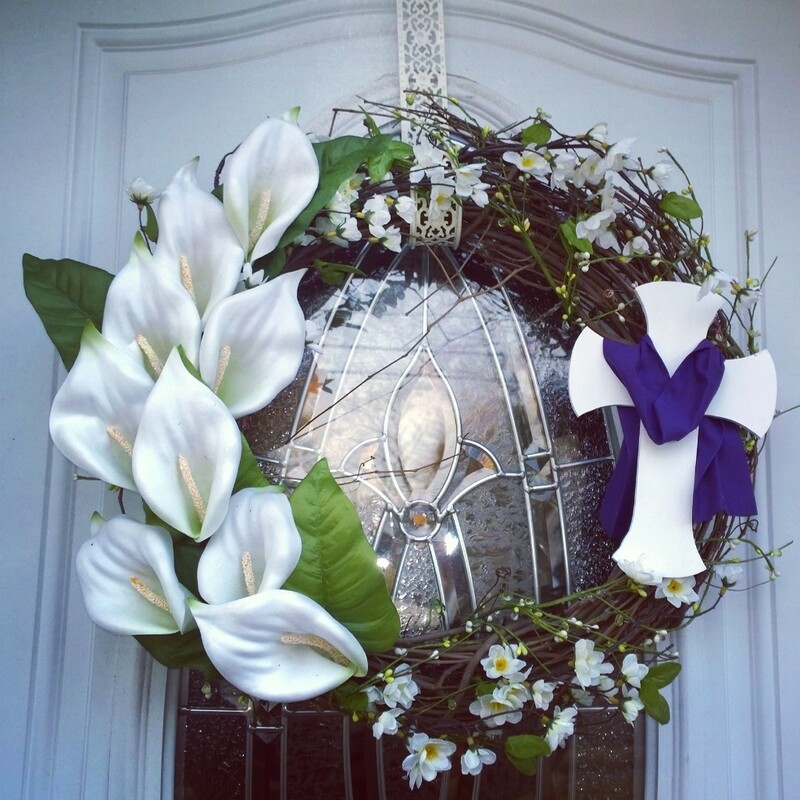 I used one bunch of the lilies for the wreath. I just trimmed them and glued them down. 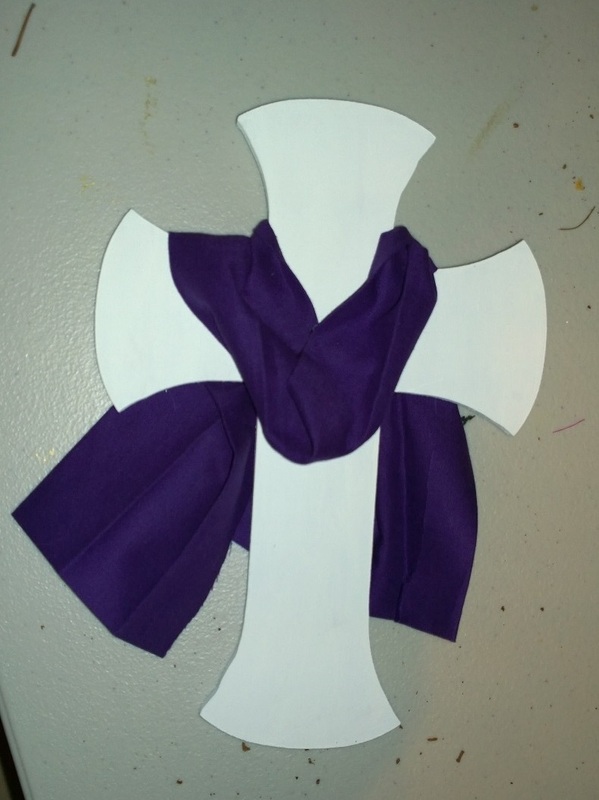 I painted the cross white and used a small purple quilting square for the pall. Everything was glued down with hot glue.